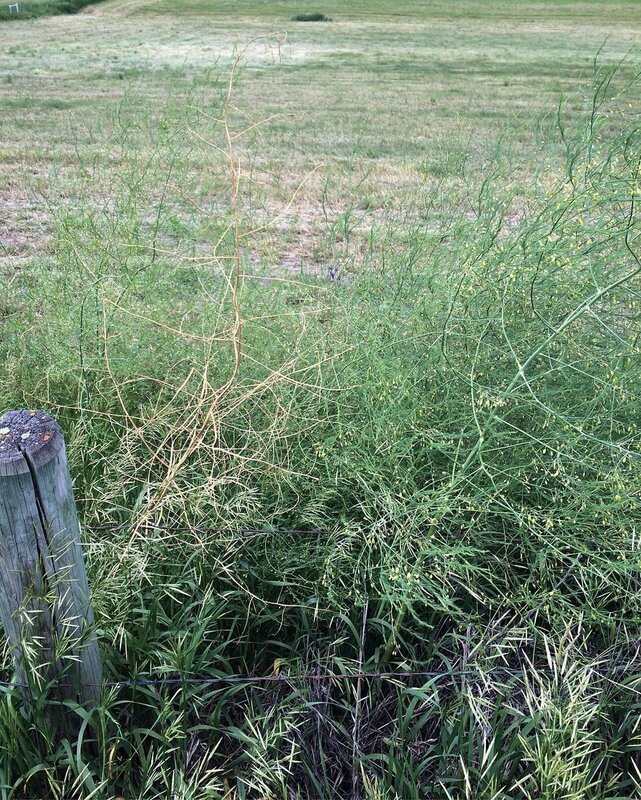 Since moving to Kamloops I have been aware of the fact that asparagus grows wild in the ditches, but for two and a half years I hadn't been able to find any! I have a friend who decorates her house in the fall with the full grown plants when they dry out to a brilliant gold, so I finally asked her this year where she finds them. People are typically very secretive about their foraging finds, but thankfully she took me on a walk and taught me all about foraging for wild asparagus. When we found the first spear I wasn't surprised that I hadn't been able to find any before. First it helps to have an eye for what the old dead plants from the previous season look like. If you look at the photo below there is a good example of what to look for. One plant is dead and the others beside it are fully grown. This plant has been dead for a while I think since in the fall they usually look more beautiful than that with all their frilly foliage and bright red berries. When you find the dead old ones - and here you have to be a bit discerning since there are a few other things that look similar after the winter (looking at you, wild mustard) - look around the base in a radius of about a foot. If you've identified it correctly as asparagus and it is the right time of year you should see some tiny asparagus spears. In most places right now the asparagus will be gone to seed like the photo above, but you might be able to still find some. Where I go there were still a few new spears poking up beside the larger, older plants. If I had been more consistent going back to collect it last month there would still be more to be had, but one person can only accomplish so much! 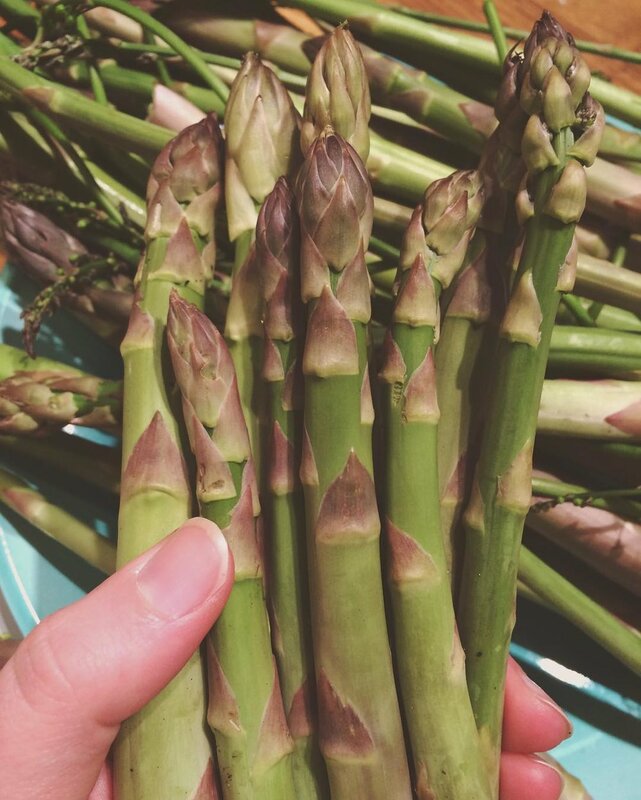 Even though these grow in the wild they look almost identical to the asparagus you would find in a store or market since they are actually the same thing! 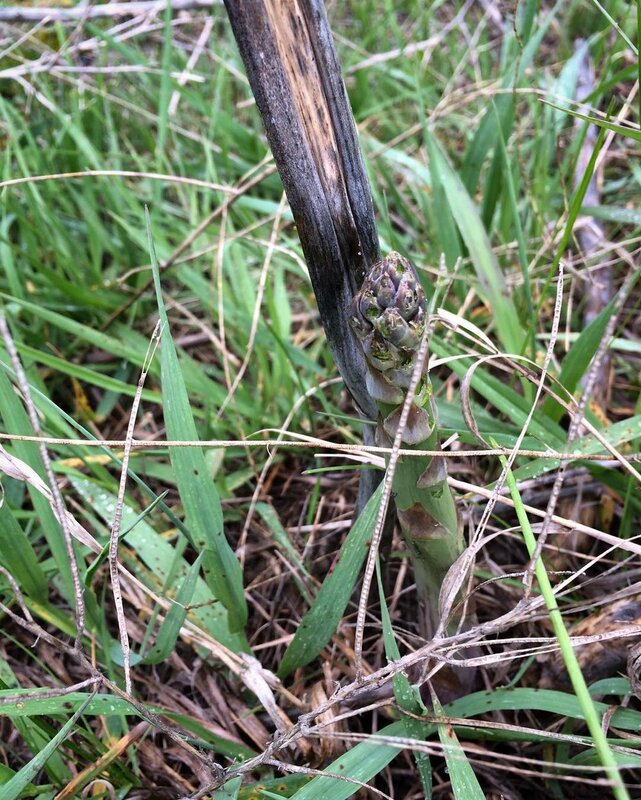 Apparently someone's garden asparagus went feral once upon a time, and now it has naturalized in the landscape. I feel really lucky since we are renting our home and I have a very limited growing space for my garden (see previous posts) and when something like this grows naturally around me it is almost like my garden is extended! Cook them exactly the same way as you would any store bought asparagus. My favourite ways include: roasting them wrapped in bacon, pureeing them into soup, pickling them, or chopping them up to eat with eggs. Wild asparagus has the most amazing taste. I imagine if you grow it in your garden and have it fresh you might have the same experience. It tastes so fresh and sweet, not unlike peas. I think the taste is also heightened by the sense of victory you get from going outside and finding your own food. 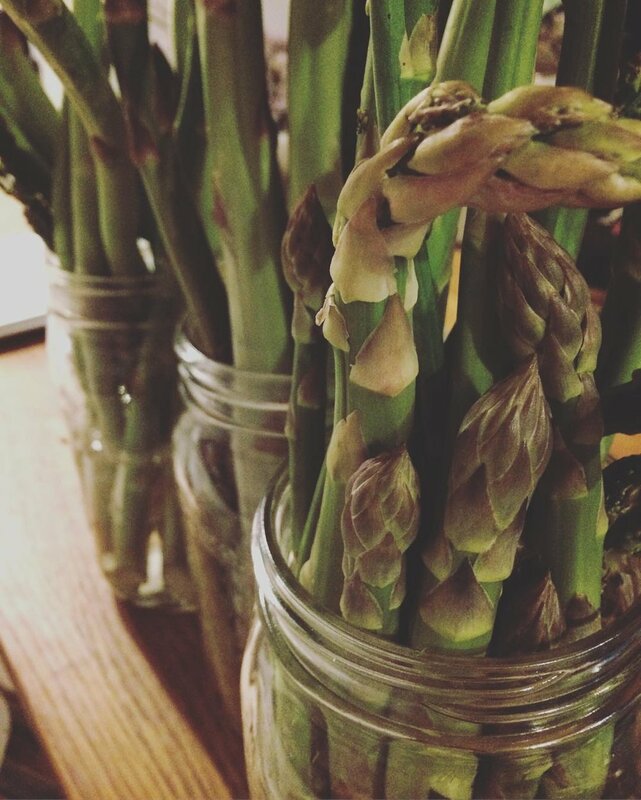 I used to think I didn't like asparagus but that is likely because I always had the type that languished too long on the store's shelf due to its high price tag. This is something altogether different and beautiful. If you don't eat them right away store your spears in jars with a little bit of water in the bottom and keep them in the fridge. They will actually keep for quite a while like this, but it tastes so good you probably won't have to worry about that! You'll eat it all long before it goes bad! Asparagus also can be frozen, but you will want to blanch it first to destroy the enzymes that will cause it to break down during storage.